Stewardship is understood as “all that we have, and all we do, all the time.” It is rooted in the belief that who we are and what we have and the life we live, and the world in which we live is all a gift from God, or even that it all belongs to God: “The earth is the Lord’s and all that is in it,” says the Psalmist. And we are stewards of it. We are the stewards of God’s household, God’s possessions, whether nature, children, buildings, time, talent, or money. If we realize that all the stuff of our world belongs to God, and we see ourselves as stewards of it, then we hear a call to mindfully use it as God would have us use it. Pledging is committing to St. Monica and St. James for the upcoming calendar year. While pledging occurs all year round, we begin our pledge campaign in the early fall ending at Advent in order to be able to publish a budget for the calendar year beginning in January. We ask that all prayerfully consider making a pledge so that as a parish we can budget for our needs and for our outreach efforts. How will fulfilling these pledges be a part of my spiritual practice over the next year and years to come? How do my pledges reflect gratitude for abundance in my daily life? In my life at St. Monica and St. James? Of all the gifts that I have received - my income and the wealth God has granted me - what proportion will I give to support God's Kingdom here at St. Monica and St. James and my community at large? Proportional Giving is offering in response to the blessings you have received. As your blessings increase or decrease your proportion can remain the same. 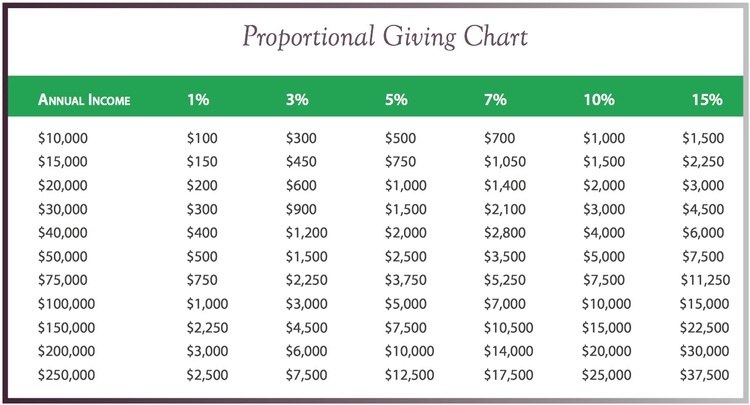 The Episcopal Church recognizes the Biblical tithe (10% of your gross income) as the "minimum standard" for giving. Pray faithfully and consider your decision carefully. We ask that for each pledging family, that you consider making a giving of five percent. For those that are financially able to we hope that you will consider a 10% tithe or more. For others, striving to a of tithe is generous goal. Everyone needs to make sure that their own basic needs and obligations are met - for some coming near to tithing is unrealistic but each gift is significant and benefits St. Monica and St. James in many ways.